When I wrote the first article in the Dead Man Walking series, I researched and evaluated most of the better known weight loss methods. I felt that Bill Phillips' book, Body-for-LIFE, was remarkably straight forward, a very different approach than most of the garbage and gimmickry that is so pervasive in the weight loss industry. Just today, I received another advertisement from some huckster who claims that his "natural" supplement makes it possible to lose "75 pounds in a month." They have testimonials to support that claim and letters of reference signed by various doctors. Don't these clowns just make you tired? It's very simple - they are liars out to defraud you of your money, just do the math. Since a pound of fat contains 3500 calories, you would need to burn 262,500 calories more in a month than you consumed to lose 75 lbs. That amounts to burning 8750 calories a day more than you ate - every single day! It's an utterly ridiculous claim, but as long as some people will believe this nonsense, these characters will keep promising it. Having lost 56 pounds in 84 days (I burned off 2333 calories a day), I can tell you for certain that there is only one way to lose 75 pounds in a month. Here ya go! Please don't share with me your before and after pictures. The reasons why the Body-for-LIFE approach works are not complicated; in fact, it couldn't be more simple. Diet and exercise is common sense and this program couples sensible diet recommendations, as propounded and promoted by the ADA, AHA and the ACS, with a sound exercise regimen consisting of the latest theories in weight training and aerobic training. Those wishing to read an in depth review of the Body-for-LIFE program may visit Dr. Hussman's website at http://www.hussman.com/eas/bfl.htm; you'll get more information than you probably feel like you want, or need, to know. I personally am not interested in the biochemistry and physiology involved - I survived that in college and I don't need to revisit it any more than I need to understand the principles of thermodynamics, and the fuel air mixture stoichiometry, involved in the operation of an internal combustion engine, if all I want is to drive my car to the grocery store. I'll tell you how I visualize it - just based on how it feels. Think about a submarine that springs a leak and picture the damage control people as using up energy when they respond. No matter how big a leak, you can only get so many damage control people to work on it BUT, if you have a lot of small leaks all throughout the submarine, a greater number of people can respond, and a lot more energy is used. I have lifted weights on and off throughout my life, but I always did what I wanted to do and avoided exercises I didn't like. I never, ever, did crunches, squats, lunges or any of those things I didn't enjoy. No matter how hard you hammer the bench press, the number of little damage control guys that respond to repair those pectoral muscles is limited. Once you start hitting all your muscles, and your heart, on a regular and organized basis, all your damage control guys get involved. Following the Body-for-LIFE exercise regimen consumes lots of energy and repairing the muscles afterward requires lots of energy too. Like a growing teenager, your whole body is working and building - you ever see what a healthy teenager can eat without gaining weight!? Come feed this skinny teenager of mine! I believe skepticism is healthy; Lord knows I'm am as cynical and skeptical as anyone. Although we received nothing but positive comments from those who visited our website, and nobody asked us about cheating, or suggested that we might have misrepresented anything, I do want to address some of the questions that I think we all have had in looking at the results claimed by others. Q1: How do we know that the people in the ads are real people? 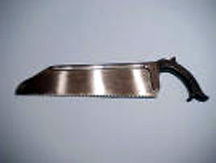 As I said in the first article I wrote, I own an Investigative Agency (www.OracleInternational.com). It was a simple matter to identify the people listed as winners and locate them - that satisfied me. Imagine the magnitude of the problem BfL/EAS would face if anyone they identified as a winner were to turn out to be nonexistent. This is a "money maker" for them and their entire program would be ruined. BFL/EAS claims that more than 200,000 people compete in this Challenge every year. Since the use of some EAS supplements is mandatory, come up with a number - your estimate on how much each contestant spends on supplements - and do the math. I spent $500 myself - if every contestant spent $500, BFL/EAS would be bringing in $100,000,000 a year. You read that right, one hundred million dollars. I would think that figure would be wildly on the high side as most people who enter do not finish the Challenge. 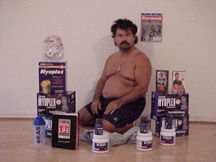 Let's say the average Challenger spends $100 - that's about enough to buy the book, a box of Myoplex and some Creatine. In that case, BFL/EAS would be bringing in $20,000,000 a year from this Challenge. I think twenty million dollars represents the absolute bottom of the low side. Whether their Million Dollar Giveaway brings in twenty million dollars, or a hundred million dollars a year, bear in mind that this figure only represents the direct sales to Challengers. Since the Challenge is a promotional thing calculated to promote the sales of their products at health food stores and so forth, we can only guess at the total money involved. My point is, do the math - what kind of fools would these people have to be to compromise the integrity of this program by getting involved in some bogus nonsense? Q2: How do we know when the pictures in the ads were actually taken? As I said in my first article, I placed my order for my "Challenge" materials a little late. Although they shipped it out immediately, I was three days into the program by the time I got it. In looking the materials over, I saw that some people had taken pictures with newspapers as evidence of the dates, but that seemed pointless to me since there is no way to identify the papers, or the dates, in most of those pictures. EAS/BfL might be able to analyze the pictures, but those of us looking at the prints cannot determine much of anything. 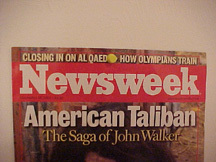 Instead of a newspaper, I took before pictures with a Newsweek magazine cover to document the date they were taken. You don't need to be able to read the dates - you can simply look at the Newsweek for the date I say it is, and see if the picture on the cover is the same. It's not real clear but anyone looking at the September 24th Newsweek can identify the picture. That's what I did - but it isn't mandatory. The program itself has no such requirement and apparently relies upon polygraph examinations to screen out those who might cheat. Readers may not be familiar with polygraph testing - during the course of my law enforcement career, I formulated a definite opinion on the subject. If I was innocently accused of serious wrongdoing, there is no way in the world I would allow my fate to rely upon any "lie detector" test unless I knew the examiner was competent. Many of them, perhaps most of them, are not. I think the BFL/EAS program could stand some improvement in this area - I don't know what the answer is. Taking a photo with a magazine cover was the best thing I could think of. Q3: How about the use of steroids or other illegal drugs? Like many of you that we talked to, the pictures in the BfL ads made me wonder about the use of steroids, or other illegal drugs too. I understand that BFL/EAS tests for that, and subjects winners to a polygraph examination, but I still wondered. I cannot say what others have done, but I can say that I spent my law enforcement career here in Naples, FL, and I was involved in a number of local drug cases including some involving steroid importation. If I was inclined to use illegal drugs, and had the extra money to pay for them, I suspect that I would have a difficult time finding anyone willing to sell them to me. The reality is, most people who want them can get them though. In this challenge, I took BetaLean HP, Betagen, Myoplex and aspirin - I mention the aspirin because I have read some things lately indicating that aspirin may have a thermogenic effect as a fat burner when "stacked" with the other things in BetaLean HP. I don't know if it does or doesn't - I took two aspirin every day because my blood pressure scared me to death. In my experience, if there is way to cheat, there will always be those who will cheat. I don't know what the answer is. I think BfL/EAS must either accept the fact that some people will have an unfair advantage or use competent polygraphers and accept their results. State and federal law enforcement officers all over the country pursue their careers knowing, and accepting, that their employment, and employability, depends upon being able to pass a polygraph examination at any time. BfL could follow the model adopted by many Internal Affairs units and subject potential winners to two separate polygraph examinations administered by two separate examiners, each with impeccable credentials. Neither examiner would know what the other examiner reported, and any difference of opinion would be resolved in favor of the examinee. You take both even if you pass the first (for obvious reasons). Fail both tests and your done - period. Q4: Men Vs Women - isn't this Challenge unfairly biased towards men? I think the answer is as obvious as it is undeniable. Women cannot lose weight or develop muscularity as fast as a man can. Personally, I think it is unfair to have one Grand Master Champion and I think it is inconsistent with the way the rest of the contest is run. In all age categories, men are judged separately from women. If BfL/EAS followed that pattern with regard to their Grand Master Champions, they would either need to split the prize, or absorb increased costs by awarding two prizes. I know the Challengers we talked to would agree that either approach is preferable to the way they are doing this now. Eventually, I suspect they will do one or the other as the existing situation is not fair - to men or women. If women never win the Grand Master Championship prize, it isn't fair to them. When the day comes (and it must come) that someone decides it is time for a female winner, that will be unfair to the men who competed that year since they weren't going to win no matter what they did. Those are the issues and concerns that trouble those of you who have been corresponding with us, and those are my thoughts as honestly as I can express them. I am sure you understand that it is awkward for me as a Challenger to critique their program, but that's what I think for whatever it happens to be worth. If Bill Phillips is still in control of things at BfL/EAS, I don't think any honest thought I expressed would be held against me. Bill Phillips' program is what it is because, unlike the liars and scam artists that dominate the weight loss industry, he is in the honesty business. Diet and exercise is a hard sell to people who don't want to hear it, but it is the truth and he preaches it. If you're paying attention, you will note that he preaches the truth even when it is adverse to his own financial interests. It is Bill Phillips, not me, that tells you in no uncertain terms that young people should not take the supplements they sell to adults. I invite you to test them on this - I did. Call EAS and tell them your 15 year old son is working out with you and wants the best possible results. I called three times and three different people told me the same thing - the only thing they were willing to sell me was protein powder. I was impressed. It is Bill Phillips, not me, that tells you that you don't need supplements unless you are competing in the Challenge. 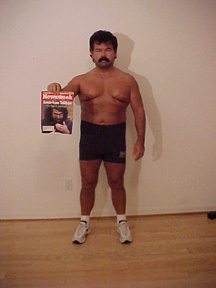 He says to approach this as a life long undertaking, and you'll get the same results without the supplements over time. In other words, if you checked his book out of a public library, or borrowed it from a friend, he is telling you that you can enjoy the full benefit of his work, without him receiving so much as a dime for his efforts in return. It is Bill Phillips, not me, that spends a fortune distributing movies intended to inspire people, hoping that some of them are honest enough to send his favorite charity, the Make-a-Wish Foundation, a meager $15. On that note, I want to point something out to you. 1 Corinthians 4:4 pretty much describes my mentality - my conscience is clear but I don't claim to be an "innocent" man. It is entirely possible that Bill Phillips is a much "nicer" person than I am. If I sent a tape to people competing for a million dollars of my money, trusting them to send a children's charity a few bucks, I'd make damn sure nobody who'd deny those kids a mere $15 had a chance to win anything from me. I'd send that tape with a postage paid envelope and a card requiring identifying information from the sender and I'd have Make-a-Wish develop a roster from the envelopes they got back. I'd compare Challenge packets against that roster and circular file anyone I sent a tape to whose name was not on it. Like I said, Bill Phillips is probably a much nicer person than I am. By the way, if any of you do as I did and hunt down any prior winners, you might ask them about that. If you find one who did not send in his check, please let me know. I didn't find anyone. I'm an investigator by profession- in this industry, we call that a "CLUE!" First, use the EAS representatives they make available to you. Don't post to the Body-for-LIFE Guestbook seeking the advice of other competitors or solicit your Aunt Bertha's opinions. Get your information from the people who know the most about this program and have the most incentive to see that you succeed. From the correspondence we got, I know that some of the EAS reps are pushy sales people who want nothing more than to sell you the most product in the least time possible. Going by your mail to us, I could name several of them who should be doing something else for a living. They are the exception rather than the rule. If your rep stinks, call back until you get one who knows the program and wants to help you. I had a marvelous experience with April, I heard great things about Eric and Tate, and many of you have mentioned others you were very happy with as well. I called and asked - EAS employs more than 60 reps and anyone unhappy with their rep will be assigned to someone else. If you ask for someone specifically, you'll be assigned to them (CLUE!). The EAS manager I spoke to assured me that they want to know which reps are doing nothing more than trying to push products. I don't know the specifics, but I was advised that their incentive system is not based upon sales. I was told that they deliberately set up their system to encourage their reps to educate Challengers, not push products. The information I was given is no secret - if you call and ask those questions, you can expect to get the same answers. If you understand that this whole "Challenge" is a promotion, you can see why they want their reps to focus on helping you, and teaching you, rather than pushing products. The object is to use you, and your results, to persuade the world to buy their stuff. The success of the promotion (and their company) depends on what you accomplish with their products, not how much of their products you bought. It seems very basic to me, but every week I see some knucklehead write in on the BfL Guestbook asking if they can use Brand X supplements when competing in the Challenge. It never fails, if you read their Guestbook, you'll see that at least once a week. God Bless their pointy little heads - some people truly have no clue! The second point I would like to make, is to encourage you to commit to the full 12 weeks. Many of those who wrote to us were not happy with their results in the first few weeks and some reported that they saw nothing really encouraging until they were halfway through the program. One of the big issues is scale weight - many of those we corresponded with (especially women) seemed fixated on the scales. I would encourage you to get your body fat tested independently by a personal trainer, nutritionist or university before you start. That way, you will have meaningful, objective criteria to go by in trying to evaluate your progress. Call your local gym - they can tell you where to have your body fat accurately measured. My program was modified pretty extensively by my EAS representative. As I said in the articles I wrote, April customized it to meet my needs - specifically to lose body fat as fast as possible. Note that I GAINED 15 pounds of muscle on this program, and you can see it very clearly looking at my back and my legs. IF I had followed the basic program, and only lost a pound a week (just for example), the scales would have shown that I gained three pounds on the program even though I actually traded 15 pounds of muscle for 12 pounds of fat. From what we heard, it seems that everyone responds differently to this program - it is hard to have any idea why based solely on e-mails. Most of those who lost less than they expected admitted to various failures to follow through. I can tell you in all honesty that nobody we corresponded with ever claimed to have faithfully worked through the entire 12 weeks without seeing significant and dramatic results. Have faith, work hard, do your best and ignore the scales. The third point I want to make involves the only negative feedback we ever got from anyone during the course of this Challenge, and my efforts to write about our experience with Body-for-LIFE. I am sure we received more than 1000 e-mails from the 5000 or so people who came to our website during the Challenge, and it would be easy to ignore the only person who had something negative to say. I would ignore it, except that her comments were clearly heartfelt and she genuinely found the things we wrote to be hurtful to her. The essence of her e-mail was that she was really down, she was having no success and she felt like her failures were being rubbed in her face. Our "bragging" about our successes only served to make things worse for her. The issue is Depression. It can be "Hell on Earth," I believe it may be the worst thing that can happen to a human being. There are times in life when we can look around and realize we slipped and fell without understanding exactly where, and how we came to get there. Falling is easy, and falling ignored can result in a long, long drop to the bottom. One day, you just wake up, look up, and wonder how in the world you're ever going to climb back out of that pit, and make your way back to the top. When that day comes, you don't get to start that climb all wonderfully refreshed and renewed - you don't magically wake up as the person you once were, and want to be again. The fog, mists and misery that blinded and confused you don't just blow away to leave a beautiful, clear sunny day. It just doesn't work like that. Whatever your failures, whatever you've suffered due to the failures of others, forget your losses. Forget "winning" too. You're not going to do that today and unrealistic objectives only set you up to fail. Today, set one small goal, target one little achievement, pursue one little victory. I don't care if all you aspire to accomplish today is to get out of bed on time. If that's where you are, focus on that, do that, and know that you are regaining control of your life. Body-for-LIFE is not just a "weight loss" book - it is about how to get a grip on your head and your life. I don't know Bill Phillips, I know nothing more about him than you do, but I see a good looking young guy, in great shape, with the world by the tail and I wonder where some of his insight comes from. Do as he suggests. Set goals - even if they are very small goals, write them down, track your progress and, to the extent that you disappoint yourself today, don't beat yourself up. Resolve to do a little better tomorrow. Do not measure yourself and the success of your efforts against a benchmark set by others - do not compare what you accomplish to what we did, or the accomplishments of anyone else. The measure of any accomplishment is the extent of the effort it required of you. Just push for a little progress every day and focus on the little victories. I have tried the best I could to answer every question anyone asked, and many that weren't asked. In closing, I would like to ask you something. If you don't believe that we are who we say we are, and we did what we say we did, why have you wasted all the time it took to read the things I have written thus far? If you do believe us, why would you care if every other picture you have seen is a fake, every other Challenger abused steroids and the whole "Million Dollar Challenge" is a scam where every "winner" is a cousin of Bill Phillips? Are you searching for a life, or a winning lottery ticket? When I started this Challenge, I was 44 years old and I'll be 45 in just a few days. I am older than the vast majority of those we corresponded with. When I started this Challenge, I was morbidly obese. A third of me, more than 70 pounds of me, was ugly, sloppy fat. I was in much worse shape than most of those we corresponded with. When I started this Challenge, I was a single parent raising four children while trying to make a living. I was busier, with a lot more "on my plate," than most of those we corresponded with. When I started this Challenge, I hadn't received the supplements because I ordered them late. I couldn't pay for them, and back to school expenses too. I was more financially strapped than most of those we corresponded with. When I started this Challenge, I didn't join a gym or hire a personal trainer; I worked out at home with my kids using equipment you can buy cheap at "yard sales." I didn't have the resources and facilities that most of those we corresponded with had access to. If you are younger, in better shape, with more time, more money and access to better equipment, look at our results and tell me what it is that stands between you and your dreams besides you?